Radar loop of Hurricane Andrew from the National Weather Service WSR radar located in Coral Gables. Crosses indicate where wind vectors were derived from radar features in Andrew, and the diamond marks Fowey Rocks station. (See discussion in Jimmy Franklin and Chris Landsea's presentations.) The last image shown in the loop was the final radar picture taken before Andrew knocked the radar off of the roof of the Gables One Tower. Hurricane Andrew of 1992 caused unprecedented economic devastation along its path through the Bahamas, southeastern Florida, and Louisiana. Damage in the United States was estimated to be about $26 billion, making Andrew the most expensive natural disaster in U.S. history. This hurricane struck southern Dade County, Florida, with an intensity assessed back in 1992 as a Category 4 on the Saffir-Simpson Hurricane Scale, based upon estimated maximum sustained surface winds of 145 mph. Because of a better scientific understanding of the structure of the windfield in the violent eyewall of strong hurricanes, the intensity of Andrew has now been revised upward for five days during its track across the Atlantic Ocean and Gulf of Mexico. Hurricane Andrew of 1992 is now assessed to be a Category 5 - the highest intensity scale possible - at its landfall in southeastern Florida with peak sustained winds of 165 mph. This makes Hurricane Andrew only the third Saffir-Simpson Scale Category 5 hurricane to impact the United States since at least 1900. Documentation for why and how these changes were made are provided in the writeup below. 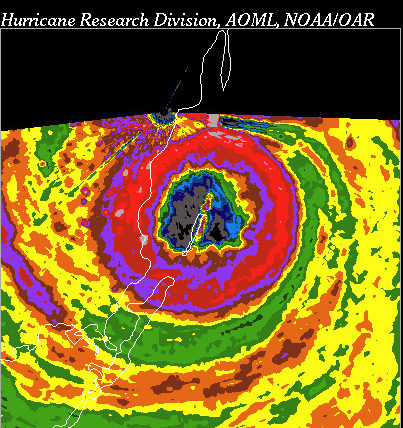 Landsea, C.W., J. L. Franklin, C. J. McAdie, J. L. Beven II, J. M. Gross, R. J. Pasch, E. N. Rappaport, J. P. Dunion, and P. P. Dodge, 2004: A re-analysis of Hurricane Andrew's (1992) intensity. _Bull. Amer. Meteor. Soc._, (in press, Nov. 2004).